Submitted by lynn on Friday, June 8, 2018 - 4:24pm. 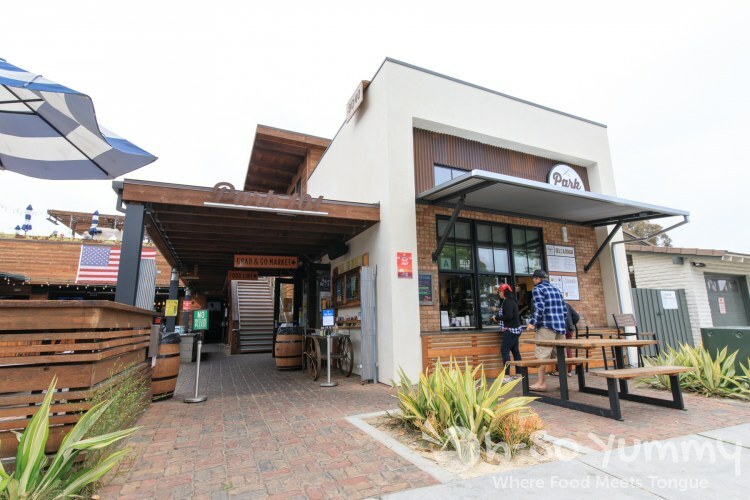 It's not often we dine in Carlsbad but the new Park 101 recently kicked off a Sunday brunch. Who else is addicted to brunch like us? 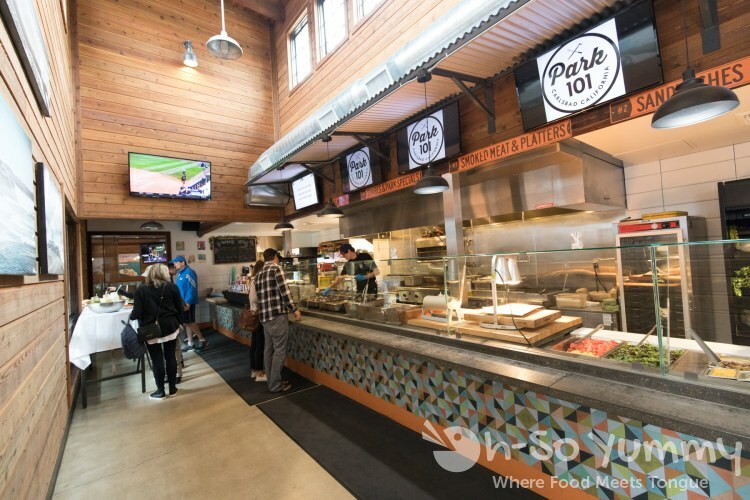 Thoughts of weekend eats which included Park 101's specialty barbecue had us eager to check out the spacious restaurant and food. The gods were smiling down on us that day because we nabbed the last parking spot on the restaurant's street! Brunch started at 10am and a few folks were already lounging in the huge patio when we arrived. To the right was the market and the food line while upstairs was a adult-only section called Tamarack Deck. Here's where the food line formed. During the rest of the week, guests would traverse from right to left, ordering food before paying. For the brunch, the line moved the opposite direction by paying at the register first. Adults were $15 while kids were $7.99 for a single pass. 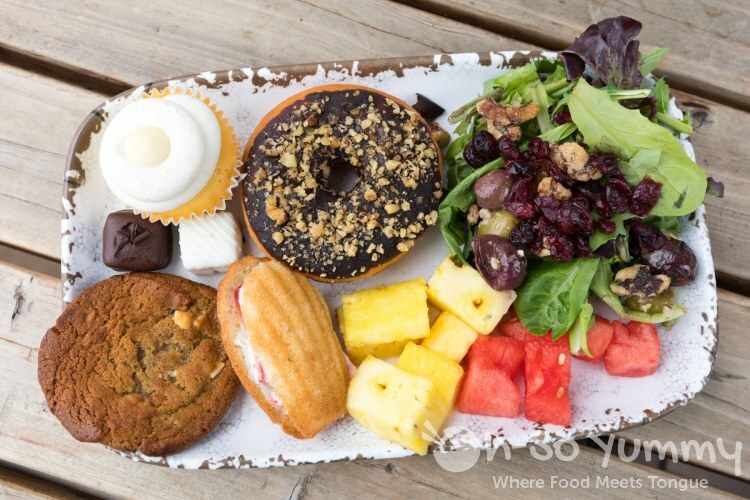 $20 gets you bottomless mimosas or add it to your brunch plan for the price of $29.99 ($5 off). Diners then select which items they want while the servers plated it. For the sake of pictures, we didn't stack ours too crazily but there were definitely some balancing acts performed by other customers! Near the register was a BYOB (Build Your Own Bagel) sandwich station! Four large mason jars (not pictured) held the spreads: cream cheese, strawberry cream cheese, pesto, and mustard. We passed giant parfaits and a glass dessert display to reach the hot foods section. 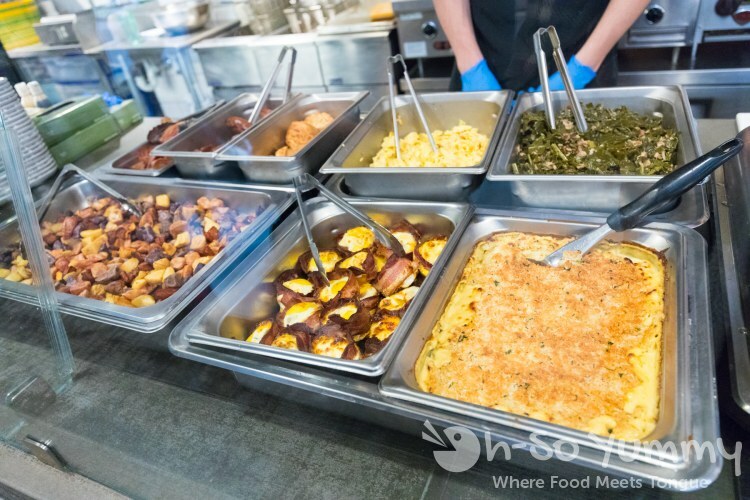 Selection included breakfast potatoes, scrambled eggs, mac & cheese, jalapeno sausage, biscuits and gravy, and collard greens. 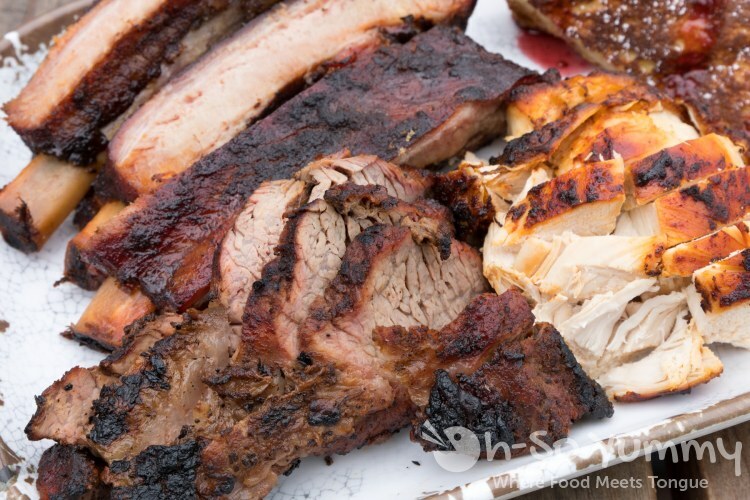 Next section was for choosing your Q (barbecue), with offerings of chicken, pork ribs, and tri-tip. 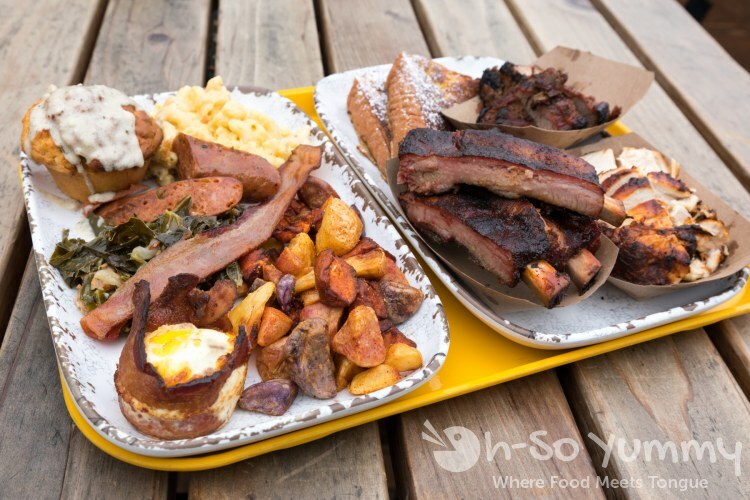 Since this place is more known for barbecue, we ordered one of each meat! There was also french toast which the server squeezed onto our plates. 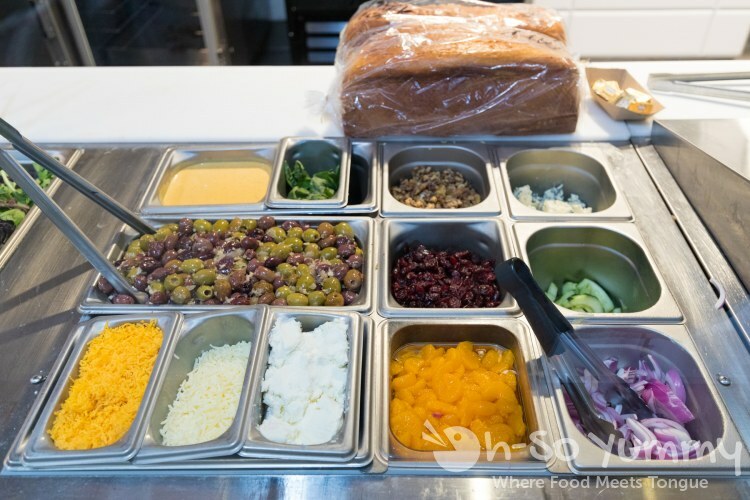 Moving forward were some healthier options of fruit and salad plus toppers like olives, walnuts and dried cranberries, etc. Nutella or jam for your french toast? Grab cookies, donuts, or muffins on your way out! 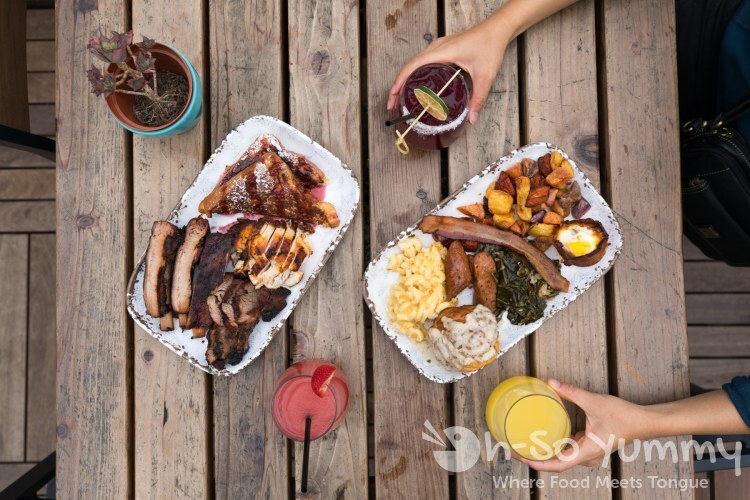 With a variety of options including barbecue meats, one pass can be plenty for brunch! 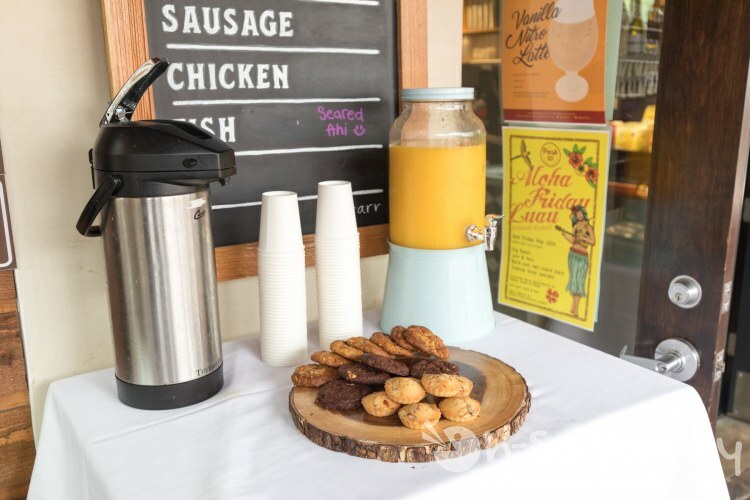 Outside was a coffee and juice station plus additional coookies. These could be eaten at leisure without requiring another plate purchase. We took a seat in the upper deck and set down our initial haul. Hello breakfast and lunch! The sausage was delightful with plenty of jalapeno flavor and a slight spice. A salted maple flavor graced the thicker cut slice of bacon. The collard greens tasted faintly of bacon too (which was mixed in) and were tenderly cooked. The Mac & Cheese kept it thick and hearty. I expected the Breakfast Potatoes to be filler food but found them to be deliciously crisp and seasoned, with perhaps a pinch of sugar too? The most unique item was in the bottom left. Shredded pork filled the bottom of this "cup" while the top was an egg layer, all wrapped with bacon! I think the cooked-through egg could have been fluffier but then again, these were pre-made sitting under a heater. The muffin shaped biscuit was big and a tiny bit stiff except for the parts covered with the herby gravy (hint of thyme or rosemary?). I'd ask for extra of that yummy gravy next time. And now the barbecue. The favorite happened to be the ribs - blackened bark and tender meat with a slightly sweeter flavor. We had three big bones in our plate for sharing! To the right was chicken breast with a gorgeously tinted skin. Dennis enjoyed the flavor but I found it to be on the drier side without sauce. Finally, the tri tip gave us that mix of soft and chewy with noticeable char flavor. 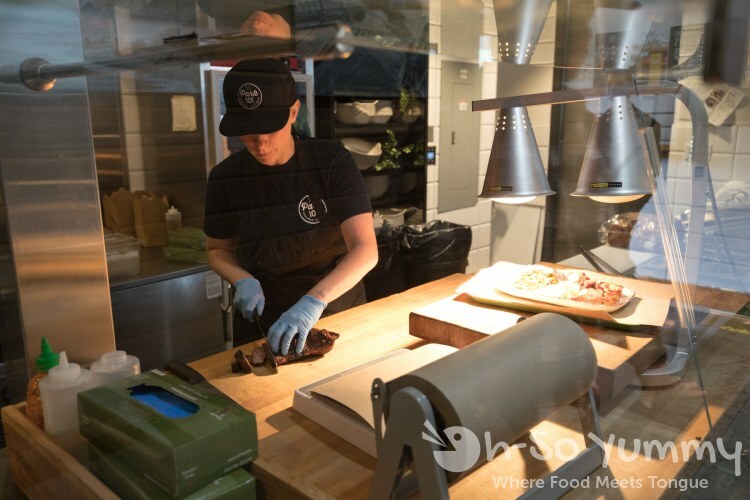 Dennis said there was no perfect section of tri-tip which explained the variety we found in our single order. The sauce options included ranch, mustard, ketchup, white sauce, barbecue sauce, and a hot barbecue sauce. We preferred the regular BBQ which had a peppery feel. The hot BBQ sauce was too spicy for my tastes. Dennis sent me back for a salad plate. I grabbed fresh cut pineapples and easy to munch watermelon for myself. Under my direction, the salad greens were topped with dried cranberries, walnuts, and olives (for Dennis). I skipped out on the dressing but in actuality, the lighter salted olives had enough olive oil residue to healthily sub as some salad dressing. On to desserts... The white chocolate chip macadamia nutcookie left us raving because of its perfect texture with a slight chew. I couldn't decide if it were more snickerdoodle-ish or sugar cookie-like. Next to it was a softened strawberry shortcake with a strong white frosting.The dark chocolate was nothing out of the ordinary but the white chocolate hid a carrot cake center! If only there were a higher cake to chocolate ratio... The vanilla bean cupcake in the top was also a bit frosting strong but we could really taste the vanilla. Dennis thought the donut was nice and fluffy but a bit bitter from the dark chocolate. I also grabbed one of the greek yogurt parfaits but the granola does lose crispiness sitting in the display. 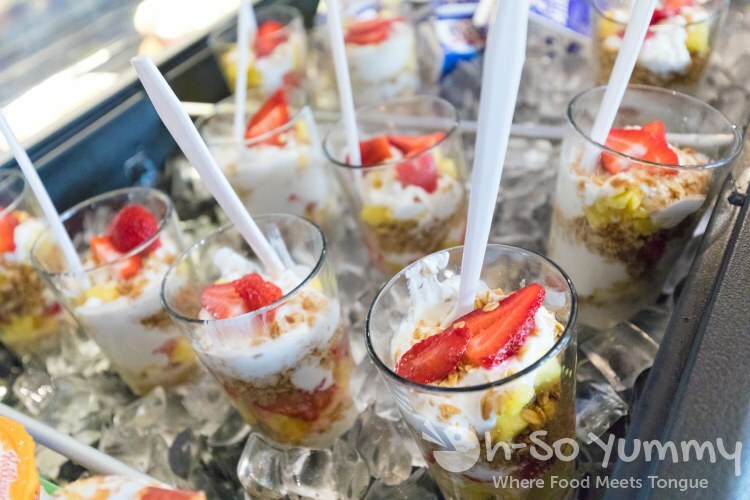 These pint glass breakfast items were yummy but quite filling. A mini size would be perfect. Drinks anyone? Dennis's blackberry margarita had a light taste but worked its powerful grip on his sobriety. I picked a pink frosé (Frozen Rosé) with a light sweetness that kept me refreshed. It melts fast so drink up! The last drink was the basic mimosa with orange juice and champagne. 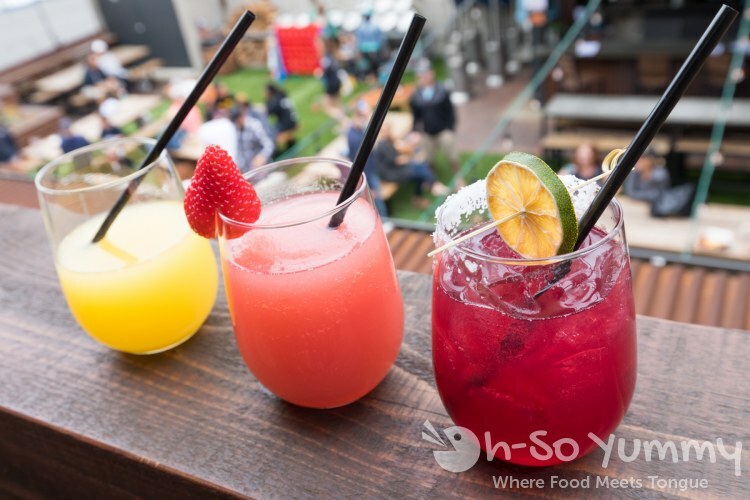 The unlimited mimosas deal includes two other fruit flavors as well as select beer from the bar. I don't remember which one because we aren't much of beer drinkers. The adult only patio is open Friday through Sunday. We found it relatively quiet and relaxing that morning. Here's a view of the entrance with the grab & go market entrance. Somehow I missed the "food line" sign so we were confused for a few minutes with no hostess in sight. Make sure to look for signs which I can totally see in this pic! 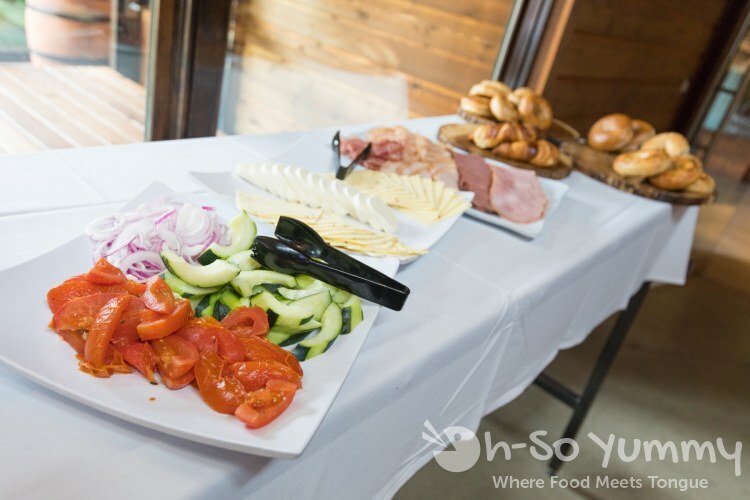 Other than that, we appreciate that they offer their barbecue meats as part of the brunch. This new restaurant is right up our alley for a casual meal in San Diego. I wish it were a little closer to home but hopefully we can return for their special weekday promos such as the aloha fridays or seafood boil. This looks like an Awesome Brunch! So much great food and such a beautiful place. It looks soo delicious...YUMMM! 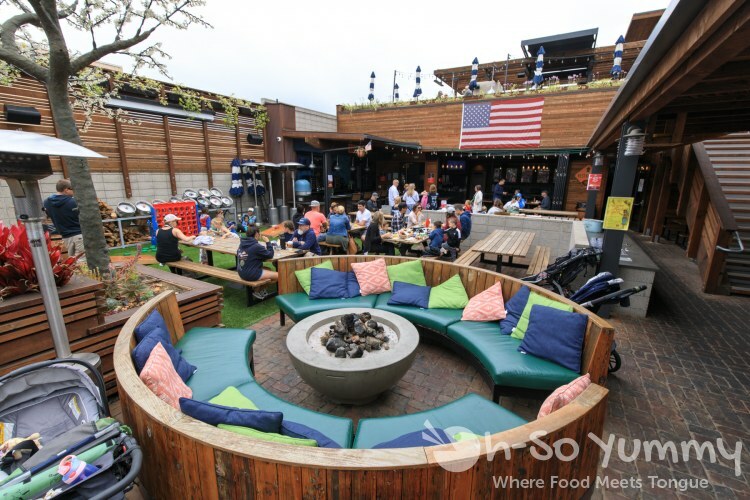 This is one cozy restaurant, especially the circle bench around fire pit feel like in our own backyard! ooh you're so lucky to have your own fire pit! yea, i always love seeing cozy spots when going out! so many families that day! it's a great community spot! 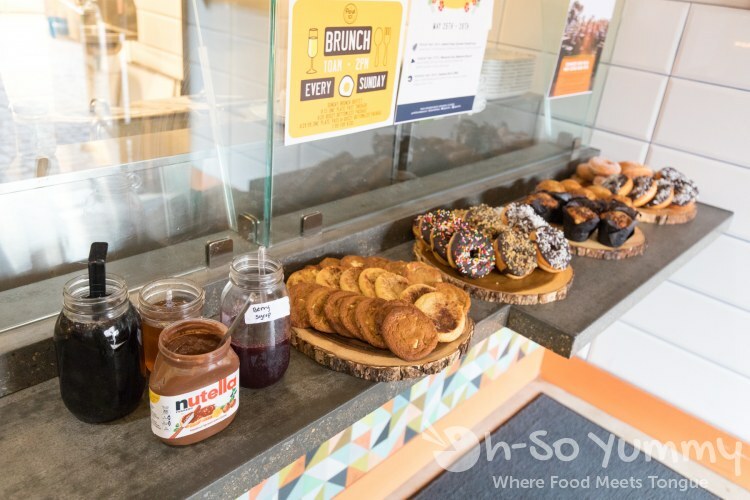 What a cozy space for an outdoor brunch, and I love the build your own bagel idea! So fun! The courtyard lawn area looks like a fabulous place for children to play and eat! the kids were so cute! this is the most kids we've seen at a restaurant lately. we're not big bagel people but i like that you can customize it! The bbq looks good! For $15 do you get as much meat as you want or just one pass through the line? The $15 is like a single pass buffet so you could get whatever food (including meat) that you want. They used to have the multiple pass for $30 but not too many people came back for seconds. Good post and great pictures. Food looks amazing! thanks! it was a great spot to discover! food and sun in one place! ready for summer! This looks awesome! Never heard of this place and don't venture to this part of town often BUT will to visit this place now. 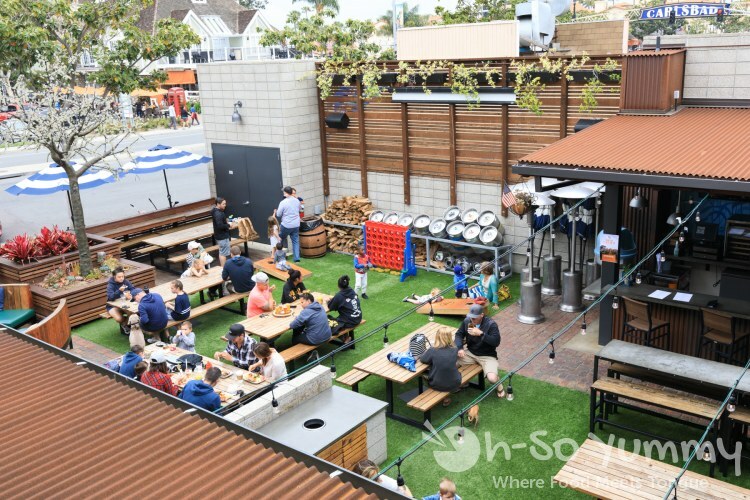 Same question as Soo - it's $15 for one pass? So does one have to pay to return to get a second helping/desserts/etc? This place is like a food carnival! I would have been a goner with those doughnuts. YUM!